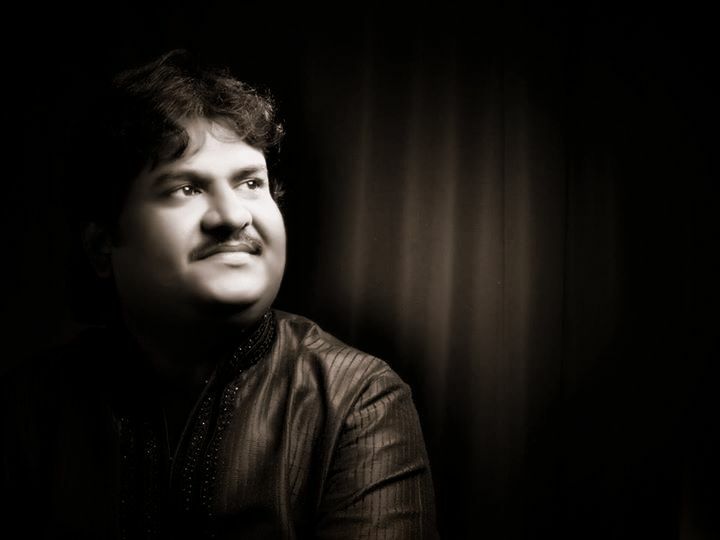 Osman Mir was born in Mandvi-Kutchh. His first Guru was his father Husenbhai. Then he was officially trained by Ismailbhai Datar. About 12 years back he settled in Rajkot. He started his career as Tabla player with late Shri Narayan Swami. Once on the auspicious day of Gurupurnima in a musical concert he went as a tabla player to Pujya Shri Moraribapu’s Ashram at Talgajrda, where Parthivbhai introduced Osman to Bapu praising his vocal ability. From this point of time his golden journey as a singer begun. He is a all India Radio & Doordarshan’s Approved Artist. His Singing a Ghazals/Bhajans/Folk/Sufi & Bollywood Style since 12 years. Non-stoppable Osman then spell bound audience through thousands of public performances. He has given playback for nearly 40 Gujarati Films. He has performed across the globe in 25 countries. His singing is influenced by as he said, by Mehdi Hasan and Ghulam Ali. They are his ideals. He hearty wishes to sing for A.R. Rehman’s composition. With the song “Mor bani thangat kare” of movie ‘Ramleela’, he entered Bollywood with a bang. His metallic voice created a magic and this song achieved 16 lacs hit within no time. Osman Mir is an “Upanishad of Secularism” . He is a trumpet blower of secularism. This born Muslim artist has performed mostly at Hindu temples, at the Ashrams of Hindu Mahamandleshwars and invariably he is an indispensible part of ‘Ramcharit Paryana” of Pujya Shri Morari Bapu. As Bapu allots him one night wherever and whenever feasible. -His Name was Nominated GIMA (Global India Music Award) functions for 'Mor Bani Thanghat Kare'. New Release Song 'Bhor Bhayo' from Bezubaan Ishq.